If you are looking for a professional plumbing company that you can trust with all your plumbing needs then look no further than the trained professionals at Guaranteed Plumbing. We specialize in all plumbing projects ranging from brand new installations, old system replacement, or repairs both inside your home or out in the yard. With you Guaranteed Plumbing you get the benefit of experience. 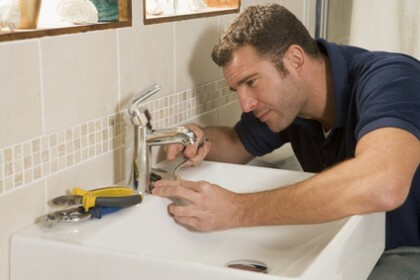 Since 2007 we have developed a solid reputation as a leading plumbing company. Our Raleigh Plumbers provide honest, exceptional customer service. We offer the highest quality products from manufacturers that you know and trust. Our Raleigh Plumber understands that you value both your time and money. We can help you save both as our repairs and installations are both affordable and performed efficiently. In many cases we can provide same-day service so that your family can get back to normal. Installing your plumbing system can be a daunting task. With Guaranteed Plumbing we make plumbing installation easy. Our experienced Raleigh Plumbers can make a quick visit out to your home, evaluate all of your needs, and then make recommendations. We can help you find a well-built, stylish system that you are sure to enjoy for years to come. We install all types of plumbing products. Sometimes clogged drain problems require the expertise of a plumbing professional. Surface clogs are generally manageable. Deep clogs caused by hard soap or scum buildup, sewage backups, or tree roots and other debris, however, will need to be serviced by a company that has both the experience and equipment to handle the toughest jobs. We can handle most jobs in an efficient manner and within a day. We will not only clear out the blockage, but also completely clean and treat your pipes and restore them back to original condition. When we complete the job you will notice a remarkable difference in the flow of your water once again. Several homeowners in the Raleigh, NC area utilize water pumps as an integral part of their plumbing system. This is why we provide water pump repair and replacement. Once your water pump goes out you need to rely on a company that can fix or replace it fast. We can fix specific components in your water pump, replace them or install a new pump entirely. This includes everything from the wiring, to the pipes, motor and several other parts. We will get your entire water pump system running at peak performance once again. If you are looking for a Raleigh Plumber, give us a call at 919-PLUMBER (919-758-6237) or complete our online request form. "Delivered as promised. they matched price of the other estimates. showed up when they said they would. completed [...]"
"We were having issues with our sewer line, I called 919-Plumber and they come out and did a [...]"
"I was very pleased with this job. The plumber arrived on time, the work was completed in a [...]"
"They did a perfect job, I will use them on all my other jobs. Showed up right when [...]"
"After calling several other companies, I called them with some plumbing issues the guy quoted me a price [...]"